Merry Belated Christmas if you're reading this! On the night of Christmas eve, Daddy Li and I kind of had this feeling that Kaitlin would wake up early on Christmas Day, and she did! This girl always wakes up early when she doesn't have school and on school days she refuses to wake up. I'm pretty sure if you're a parent, this is familiar to you. 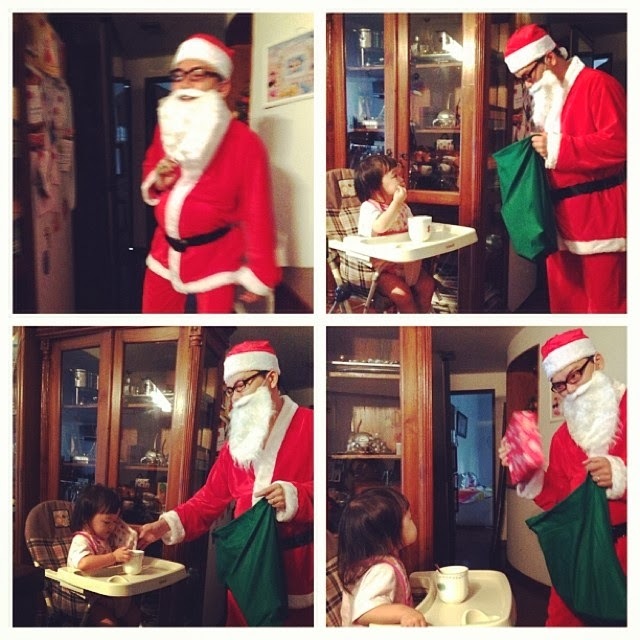 So while I got Kaitlin to start eating her brekkie, Daddy Li got changed into Santa Claus! Yes! Santa delivered presents to Kaitlin on Christmas morning. A little different from the usual tradition of Santa bringing presents before Christmas morning, but this way Kaitlin could get to see Santa up close. We aren't sure if Kaitlin knows that it's indeed Daddy Li under the costume, but she was just pretty neutral about it. She wasn't terrified, but neither was she keen on saying Hi to Santa. She did want the presents though! 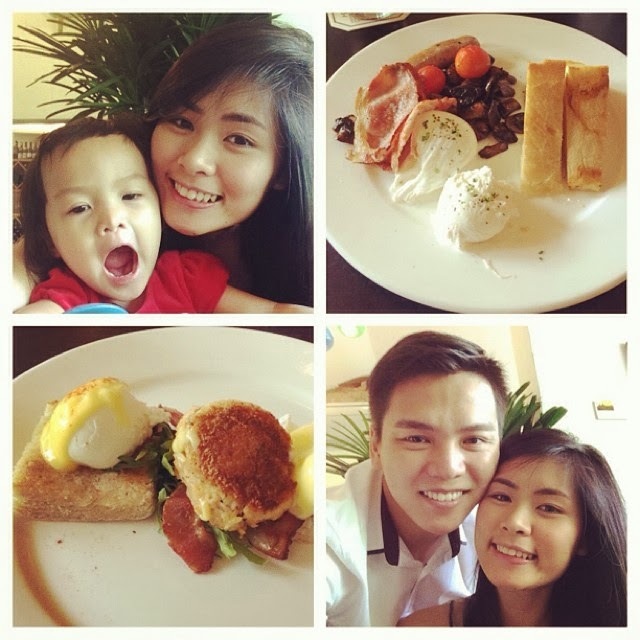 After breakfast, we showered and headed for our Christmas Day brunch at Spruce at Phoenix Park. Food and service wasn't fantastic and in fact we felt it was worse than our first visit, so I doubt we'll be returning to Spruce anytime soon. Other than that, we had a nice time just chilling as a family together and watching Kaitlin nom on pancakes (which really weren't that great). After brunch, we did some grocery shopping cos Daddy Li and I were going to cook Christmas dinner together! It was kind of like our couple bonding activity. We went home, and a cranky Kaitlin had her nap. We had wanted to start prepping dinner before she woke up, but this little girl got up earlier than usual so we just made do and prepared our ingredients for dinner while entertaining her. We popped out of the house for a little while to rent some dvds and to get a little snack (yay orh luak!). Kaitlin wanted to have some watermelon, so I got her a slice and she finished everything that was on the plate! We rushed home after and started cooking dinner. 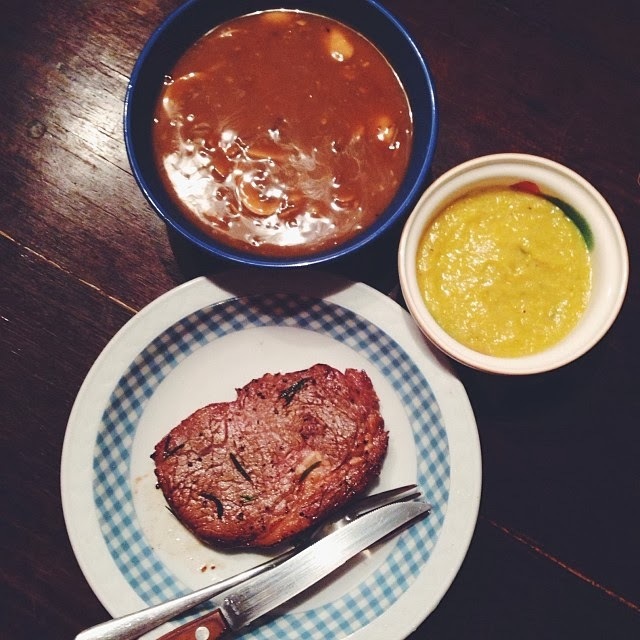 We made cream of corn soup and steak with a huge a** bowl of mushroom sauce. For desserts (didn't take a picture!) we had chocolate fondue with strawbies, kiwi and blueberries! Though Daddy Li and I didn't talk and joke around much while cooking (at first my tummy was feeling unwell and then later on we were in serious mode rushing to finish cooking dinner! 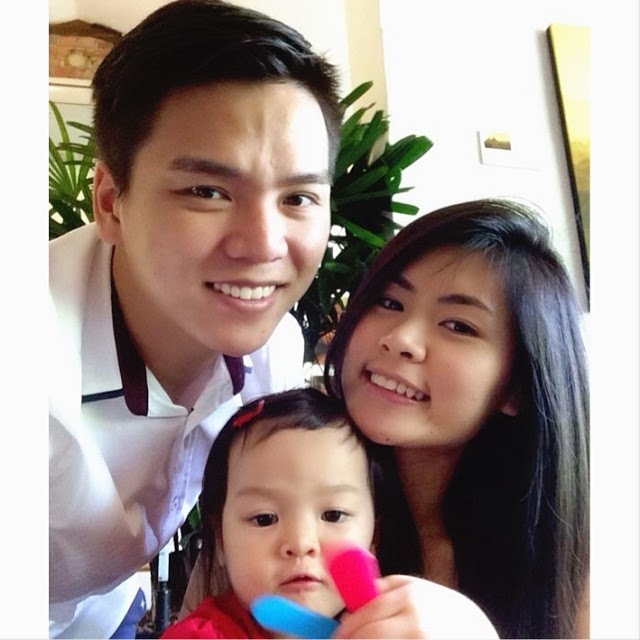 ), I super love the bonding time we had. We should totally do this again hubs *winks*! After all of that, we showered Kaitlin and accompanied her to sleep. Daddy Li and I ended the night off watching one of the dvds we borrowed. It wasn't a happening Christmas, like we weren't out and about much and celebrating but it was sure nice to be able to spend time with Kaitlin and Daddy Li. This is family life isn't it? You skip the parties that are fun and sometimes might be memorable and instead spend time with the people that matter most, and those are the memories that are really going to last a lifetime and that you'll always treasure close to your heart. I won't lie, I do miss the parties and hanging out at night without having to worry about anything at all. I could do that now if I wanted, but I know full well that I could never be really happy or not feel worried cos Kaitlin would be at the back of my mind. It might sound like I'm the one that has separation anxiety issues, but really..once you've your own child, one that means the world to you and that you can't help but love and care for unconditionally, everything is different. But definitely different in a good way and I wouldn't exchange this family and this life for anything else.